It takes just minutes to change a person’s entire week. Smile On Seniors™ is a unique volunteer program, created to enhance the lives of local seniors. Many of us have parents or family who are seniors, living alone or in senior facilities, that would greatly benefit from an extra visit from someone who isn’t family. Family can not always visit as often as desired, and not always is there someone else to supplement those visits. And that’s where Smile On Seniors steps in. SOS matches local volunteers with local seniors for a weekly visit, bringing joy and a sense of caring to many. 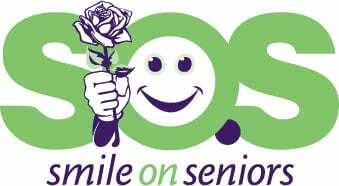 With your help, SOS soon hopes to match a volunteer with every Jewish senior! Prior to initial senior visitation, you are required to participate in a brief orientation session, which will take place at the assigned facility. Orientations can be arranged for individuals or small groups. These sessions will ensure that you will be prepared to have a successful initial encounter with your senior. Upon your arrival, an assisted living or nursing home program director will be available to direct you to your assigned seniors. Program directors will give you a guided tour of their facility. A major goal of the Smile on Seniors program is to train volunteers that are interested in developing a long term relationship with their senior. SOS coordinators work to schedule your visits, and you are encouraged to be consistent with your weekly visits. Anticipating future visits with an SOS volunteer can help seniors maintain a more positive outlook; therefore, consistency is a crucial key to a relationship that is beneficial for the senior. Bringing your children along on a visit is beneficial for both the seniors and the children. The seniors love the young company, and the relationship with the seniors has a positive effect on your family. Don't be concerned about the commotion that always accompanies kids. It can be a welcome change to the usually sedate home environment, and studies show that elderly people enjoy seeing and spending time with children.